Define a Signal, Define a Trigger and Click on RUN. Its that simple to get going. The DigiView software is designed to make configuration an easy task and less time consuming than most PC based analyzer systems. The easier it is configure and understand your Capture and Analysis tool, the easier it will be to achieve successful results. Configuration options can be accessed by using the CONFIG menu. 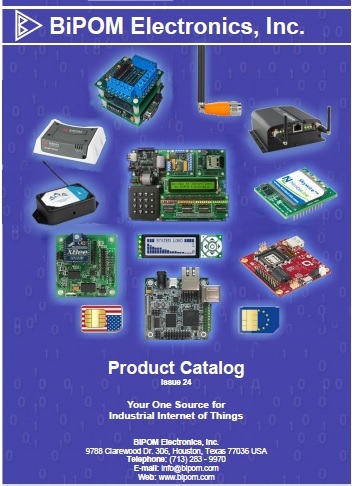 After the hardware is connected to the PC, the first step of configuration is to attach the physical channels to the circuit and create a Signal definition that uses those channels. After defining a signal and selecting its channels, click on the Preview button for instant data viewing. Defining Signals - Select a Signal type or Plug-in to add to your project. When added, the editor will appear with all configuration options specific to the chosen signal. Select the channels and then rename the signal to something descriptive if you wish. 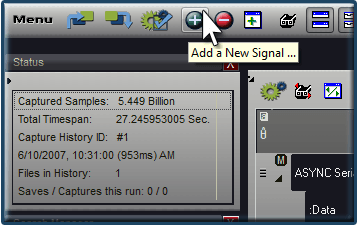 Once you are finished, the rest of the application, including menus and trigger editors, will display the newly added signal by its name. Trigger Setup Options - DigiView's trigger configuration screen centers the user's focus on function; making it much easier to quickly analyze and modify a very complex trigger condition. The Trigger Configuration Screen introduces a dual-mode (GUI and text), schematic-like approach to configuring the matches, sequencers and trigger output from a single window. A text window shows the 'formula' for the configuration while the graphical 'schematic' shows the flow. Analyzer Options - Each DigiView model has a different set of options that can be adjusted directly from the software. Options may include Buffer size, Prefill percentage and enforcement, Threshold voltage adjustment(s) and Mode. Acquisition & Capture History Options - These options include the default behavior when data is loaded such as scrolling to a marker or the trigger point, and the detailed settings of the Capture History. Capture History settings specify limitations on storage and the default setting for saving or discarding new captures (which can be overridden by Plug-ins or settings in individual Auto Search Windows). Environment Options - These options control the application startup behavior, sounds, waveform row size and other non-project related settings. Selecting a Color Theme - The color theme can be changed to one of the 8 pre-set themes or a custom color theme can be created.